Krav Maga is the official Self Defence system of the Israeli Military and is used by hundreds of Law Enforcement agencies throughout the world, it is also extremely popular with civilians. Krav Maga Techniques increase stamina, strength and flexibility. Tested under stressful conditions and on the streets, Krav Maga’s practical approach to self defence will make you safer and more secure. The Institute of Krav Maga UK will educate and arm you with the latest in reality based self protection techniques, tactics and mindset designed to keep you safe. Krav Maga is currently taught throughout the world because of its easy to learn, dynamic techniques and practical approach to self protection. Anyone can learn Krav Maga in our classes. 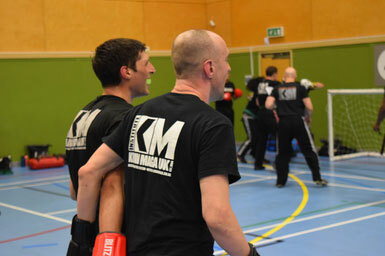 Though self protection is the main goal of Krav Maga, the techniques, conditioning and drills make Krav Maga the ideal training for self defence and fitness. Its a mixed martial arts (MMA) for the street – when there are NO RULES – NO REFEREES! Trial Classes Are Non Refundable Ensure You Book A Time Slot That You Can Attend!